"Delicious and filling - great with homemade soup!" Place sausage and onion in a large, deep skillet. Cook over medium high heat until evenly brown. Drain well and set aside. Preheat oven to 375 degrees F (190 degrees C). Lightly grease a 9x13 inch baking pan or casserole. In a large bowl, combine green pepper, cornmeal, eggs and creamed corn. Pour half of the batter into the prepared pan. 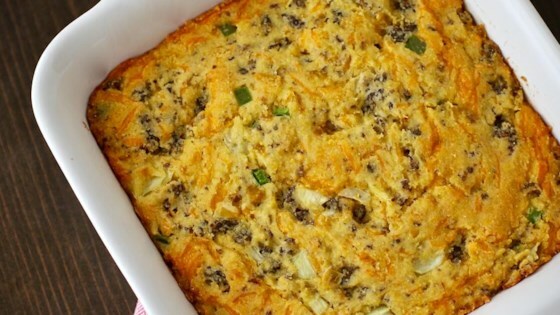 Sprinkle batter with sausage, onions and cheese. Pour on remaining batter. Bake in preheated oven until brown, about 35 to 45 minutes. This was a good dish, especially when served with warm syrup. I will definitely try to use the self-rising cornmeal next time though, to fluff it up and make it easier to spread in the pan. Very good! I was worried because I didn't have self-rising cornmeal, but it turned out fine with regular cornbread. I also added chopped jalapeno. Just use a box or bag cornbread mix. It's very tasty as written. Would make a great turkey stuffing.